Gnocchi. Nyo-kee. More than just a funny-sounding word for an Italian dumpling, gnocchi are fluffy pillows of potato or ricotta based dough swimming in sauces that vary from a simple brown butter to a rich bolognese. It is one of our favorite dishes to order when we go out for Italian, especially at places notorious for their homemade pasta. 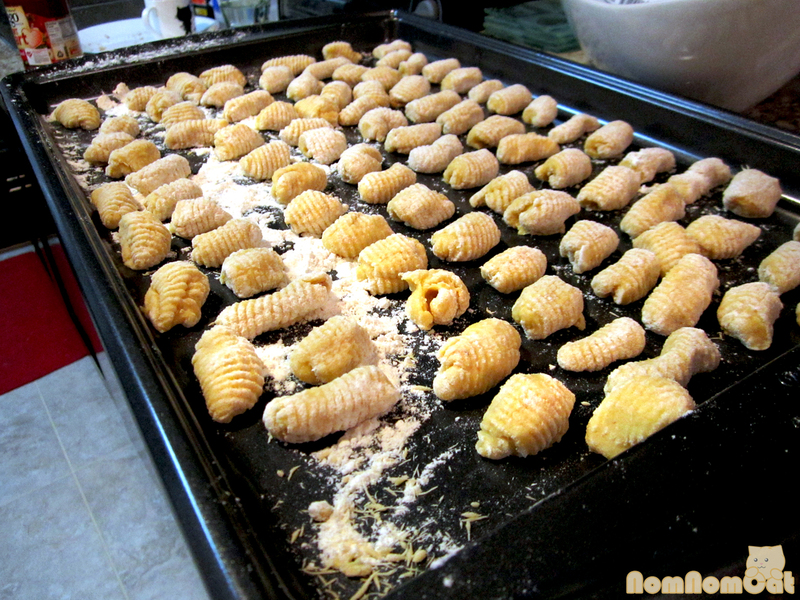 Finally one day, Martin had the brilliant idea to try making gnocchi ourselves. 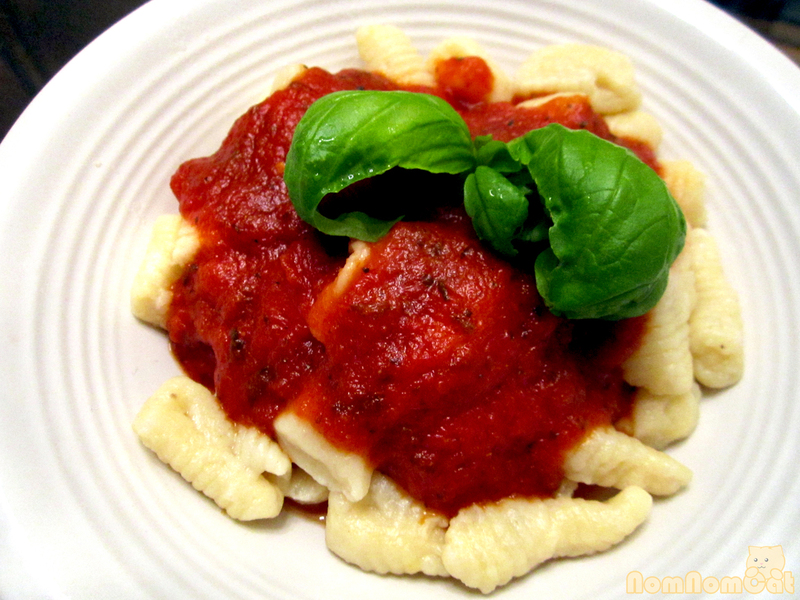 As it turned out, making the gnocchi dough was relatively easy – considerably less finicky than semolina pasta dough. It does take some time to bake and cool the potatoes, but I think it’s worth having to plan ahead; baking yields a better dough texture than boiling does. 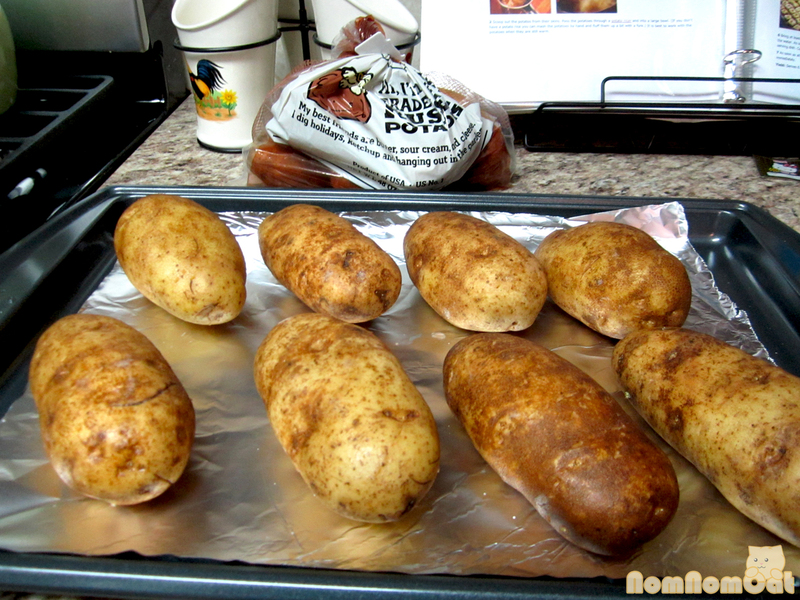 Scrub the potatoes under running water, leaving the skins on. 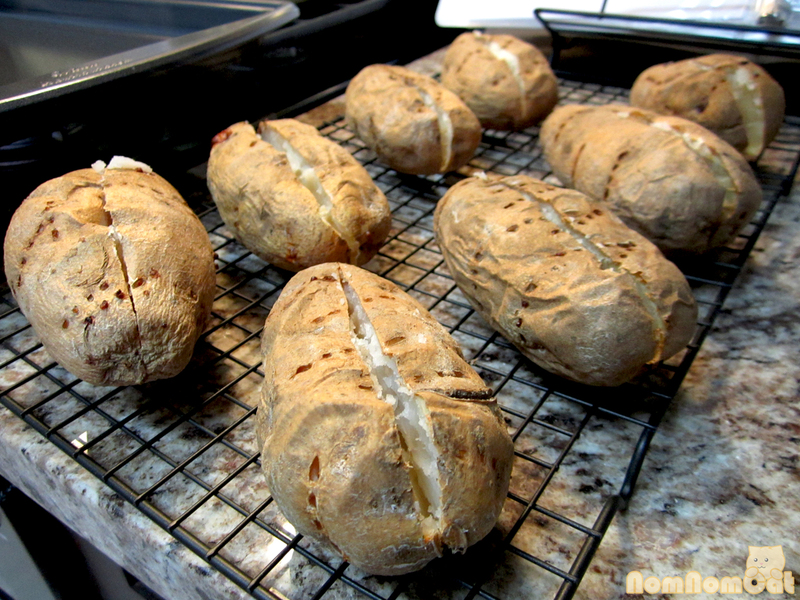 Stab the potatoes all around with a fork, the way you would when baking sweet potatoes. Line a baking sheet with aluminum foil, arrange the potatoes equidistant from each other, and bake at 350 degrees for about 1 hour. Time to cool the potatoes! When the potatoes are tender and the skins have started to wrinkle and pull away, transfer to a cooling rack and slice them open down the middle to let the steam escape. I waited about 15-20 minutes until the potatoes were still warm but cool enough to handle. 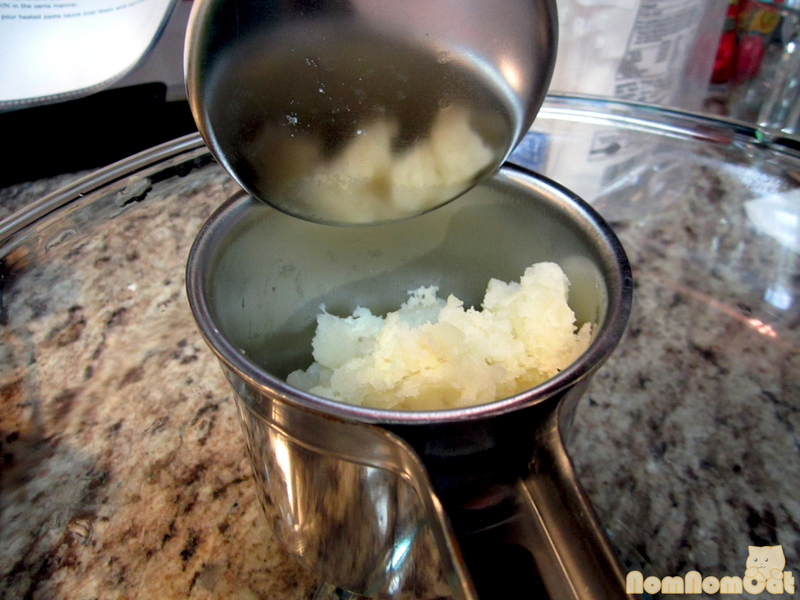 Remove the potatoes from their skins and either mash with a fork or strain through a potato ricer into a large bowl. 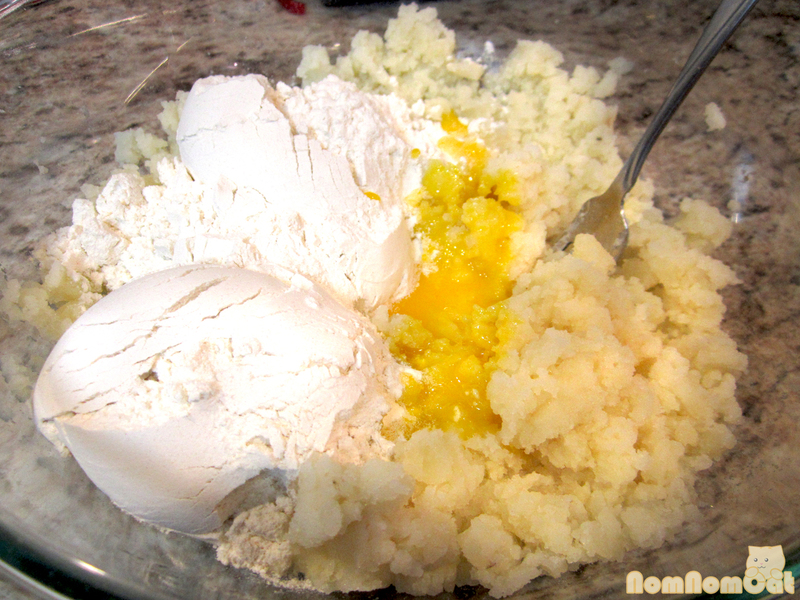 Add the two egg yolks , lightly beaten, and the flour and salt to the potatoes. 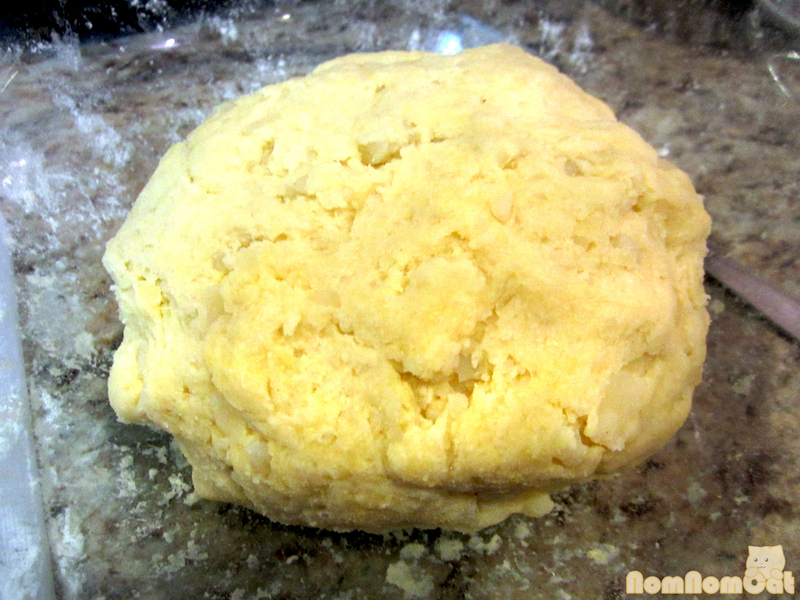 Stir to combine but do not overwork the dough or the gnocchi will be tough and dense instead of light and fluffy. The mixture should just start to form a doughy ball. Lightly dust a cutting board with all purpose flour. 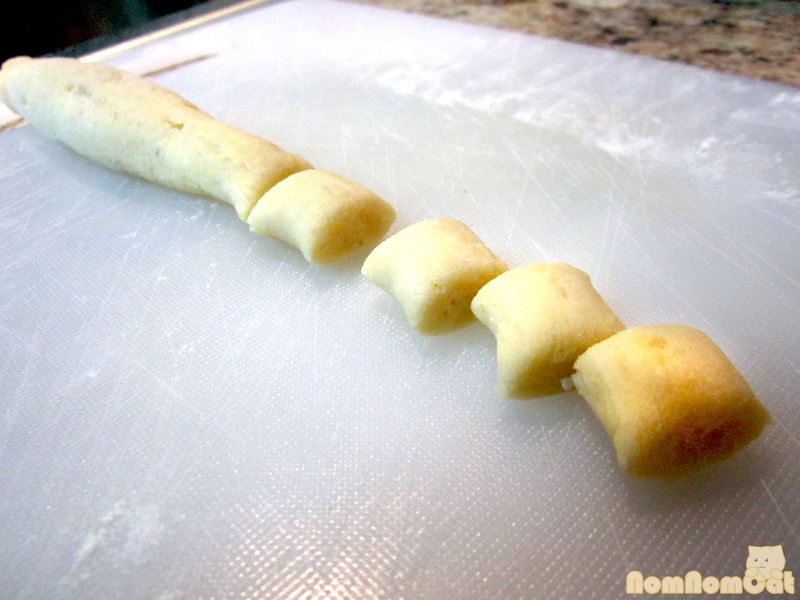 Working with a handful of dough at a time, gently roll out a tube about the size of a breadstick. 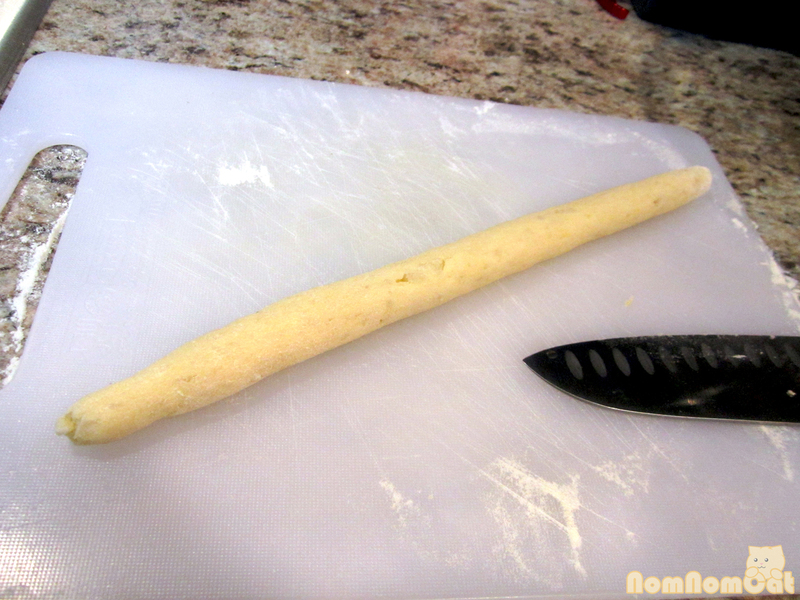 Using a sharp paring knife, cut the rolled out dough into small pieces, about 1 inch long. We have a gnocchi board, but you could also use the back of a dinner fork to roll out the gnocchi. 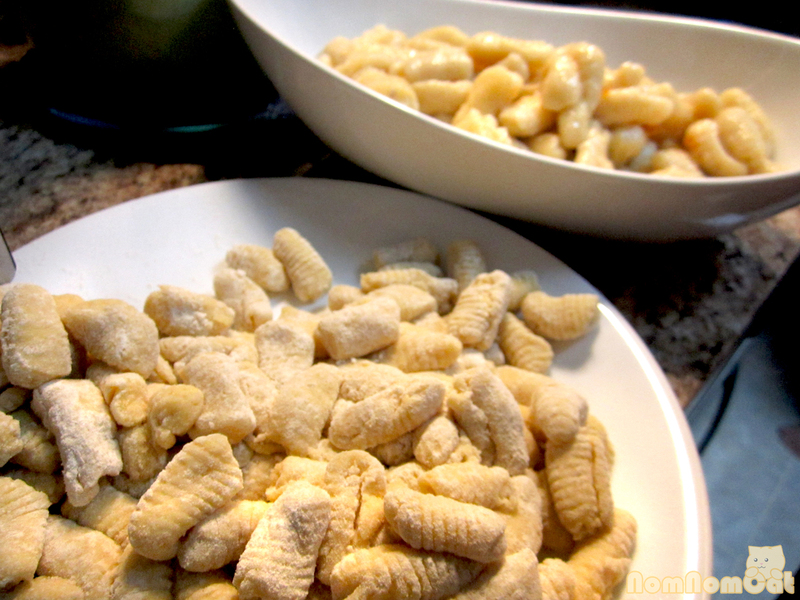 Whichever you choose, be sure to flour it so your gnocchi don’t stick. 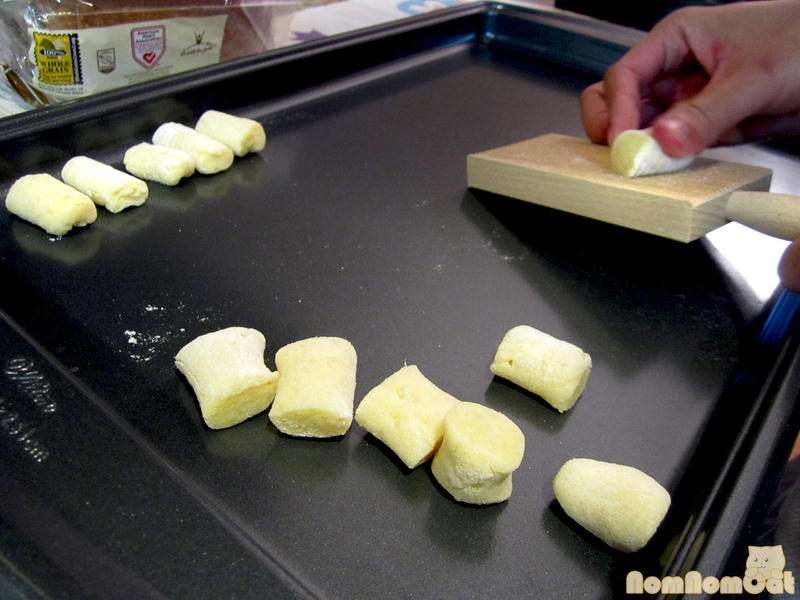 Holding the board (or fork) at a 45 degree angle, start the gnocchi at the top and press down and forward with your thumb. It is hard to describe, but you are essentially smearing the dough so that rolls over on top of itself as demonstrated in this how-to video we found on Youtube. 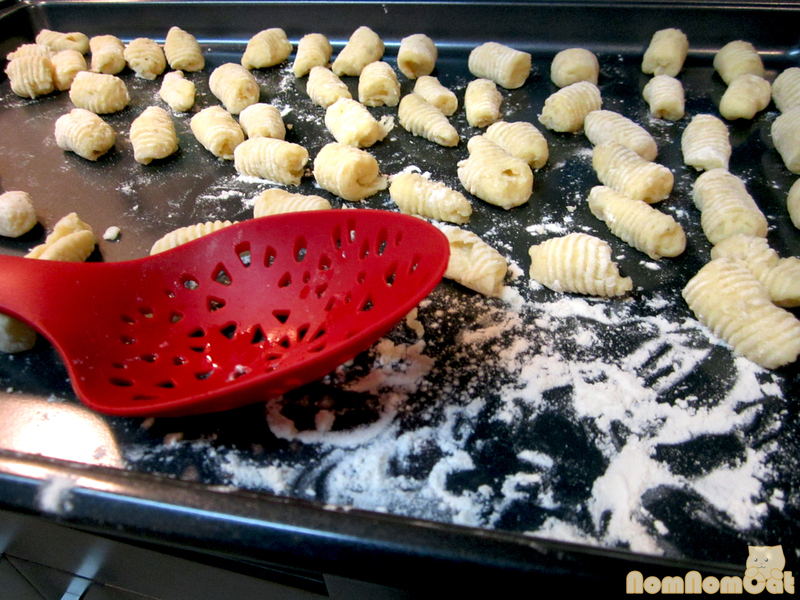 Set your finished gnocchi aside on a floured baking sheet and repeat until you use up all of the dough. Just wait until they float! Bring a pot of salted water to a boil. 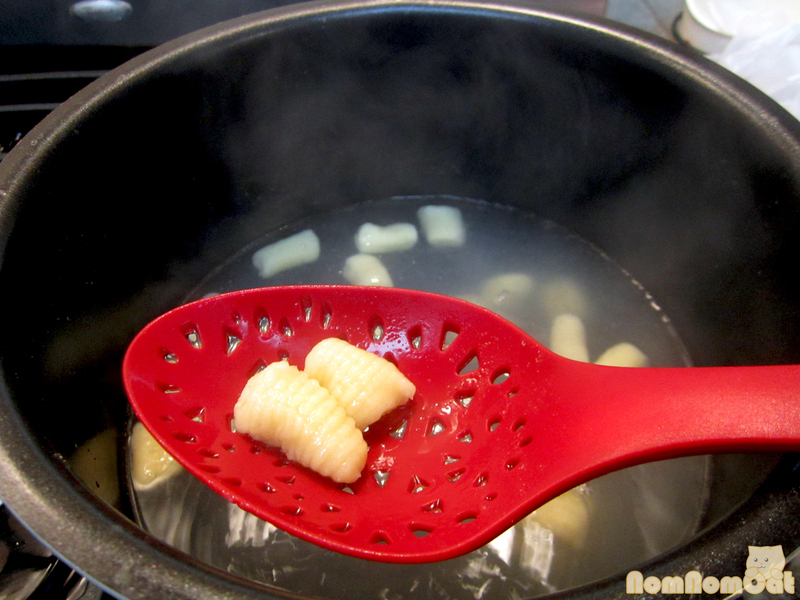 Drop in the gnocchi in batches, maybe two handfuls at a time. They will be done when they float. Scoop out with a slotted spoon and transfer to a serving dish or individual bowls. Just top with your favorite sauce — we used a simple arrabiatta made with garlic, white wine, canned San Marzano tomatoes, and dried red pepper flakes. The ridges are great for catching the sauce, and each gnocco is a tender, pillowy cloud of potato goodness. Writing this entry made me crave a warm, hearty bowl of gnocchi again… I think my next experiment will be a sweet potato gnocchi with a sage brown butter sauce. Will report back on how that goes! This post is part of the monthly link up party Our Growing Edge. This event aims to connect food bloggers and inspire us to try new things. While Martin and I have made fresh pasta on many occasions, making our own gnocchi had always been just another item on our Bucket List until recently. In retrospect, it is a bit ironic that the small wooden gnocchi board was a more intimidating piece of equipment than our Marcato pasta maker. This month is hosted by Stacey at The Veggie Mama. Great submission! I’ve made gnocchi a couple of times before and both times they were much better and lighter than the ones I’ve eaten at restaurants. I never knew there was such a thing as a gnocchi board (I just gently squished them with a fork). Gnocchi is one of my guilty pleasures. I have to make mine gluten-free, but what a treat. Thank you for posting.